So the other night I made a new Rachael Ray meal called “Well Dressed Salmon” and it was great, Matt even said it was his favorite Salmon dish’s so I had to pass this on with PICS of course!!!! HINT: 1. 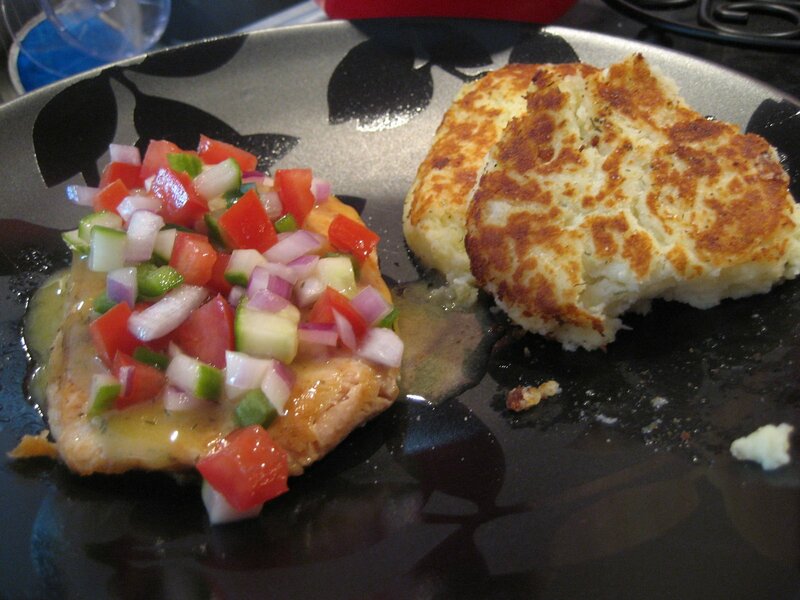 I used the new Oreda frozen Idaho potatoes, real potatoe’s you microwave then finish like real potatoe’s. 2. I may add a bit of 1/2 & 1/2 to this recipe if I were you I thought the cakes were a tad dry!! Peel and dice potatoes and add to a large pot. Cover with water and salt the water. Bring to boil over medium heat, and cook until tender. Drain the potatoes and return to hot pot to dry. Transfer potatoes to a bowl. Soften cream cheese in a microwavable bowl and microwave the cream cheese for 20 seconds on high. Add to the potatoes along with sour cream, scallions, zest, egg, salt and pepper, to taste. Mash potatoes to combine mixture. Hint: I added finely diced Jalapenos to the veggie mixture and it was faboosh! On a cutting board, dice cucumber into 1/4-inch pieces – to peel or not to peel is up to you. Seed and dice the tomatoes into 1/4-inch pieces. 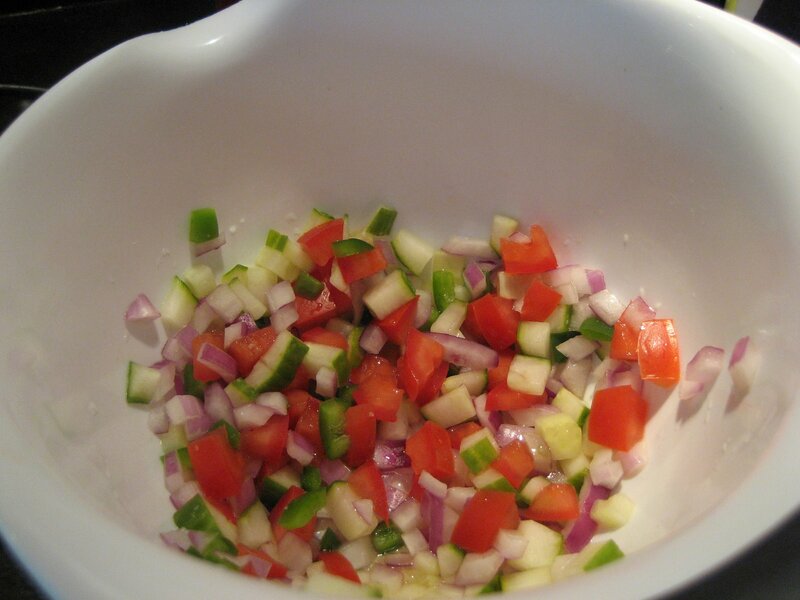 Combine the cucumber, tomatoes and half of the shallots or red onion in bowl and reserve. 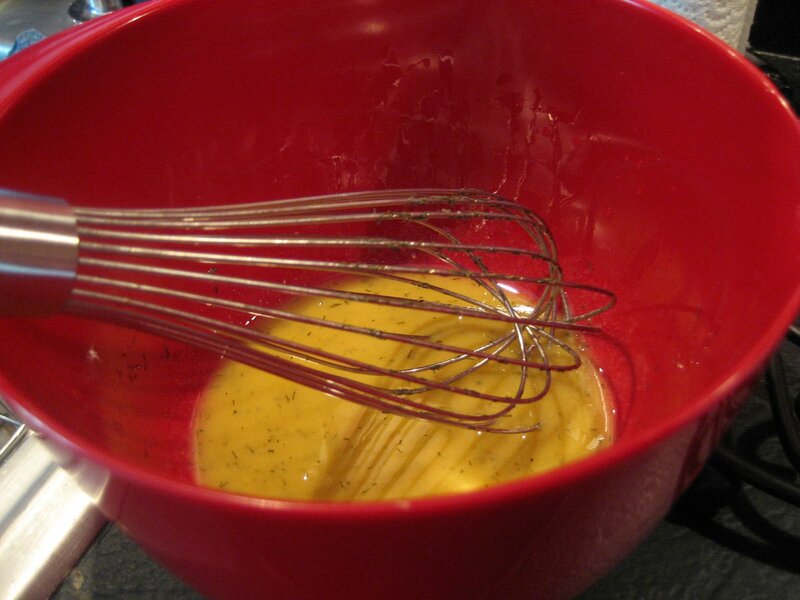 In a small bowl, whisk together mustard, sugar, and white wine vinegar and remaining half of the shallots. Stream in extra-virgin olive oil while continuing to whisk. Stir in dill and season dressing with salt and pepper, to taste. Season the salmon with seafood seasoning and a little black pepper. 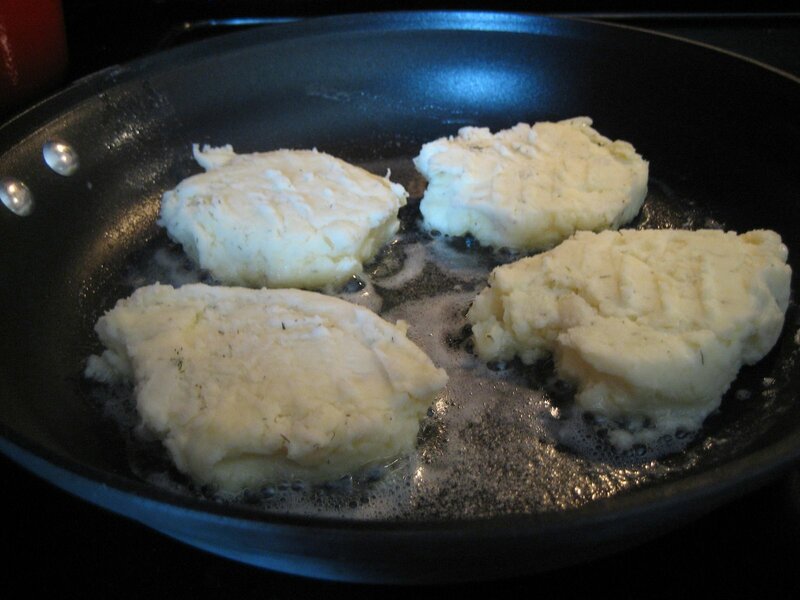 Heat a nonstick skillet with a drizzle of extra-virgin olive oil over medium-high heat. 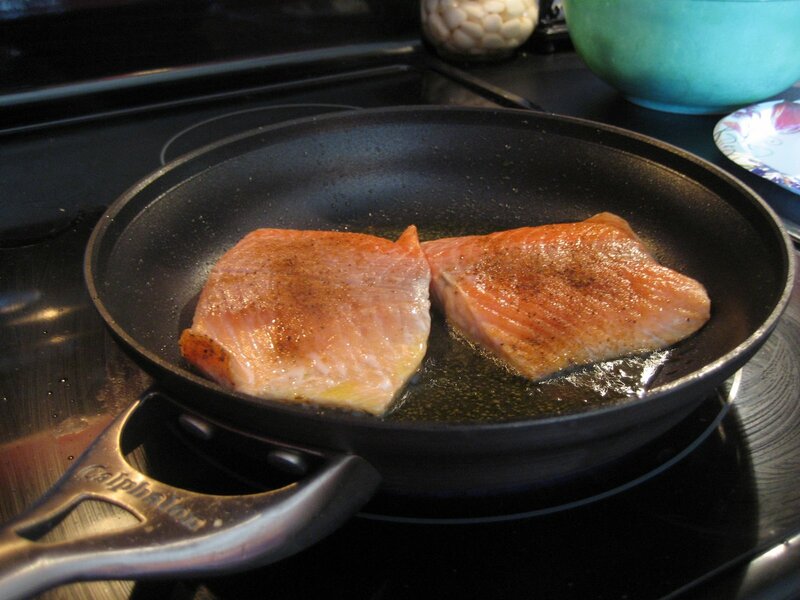 Place salmon rounded side down and cook until golden and a little crispy at edges, 3 to 4 minutes. Flip and cook 2 minutes more for a pink center, 4 minutes for opaque fish. Transfer salmon to dinner or serving plates, top with the cucumber-tomato relish and cover with a liberal amount of dill dressing. 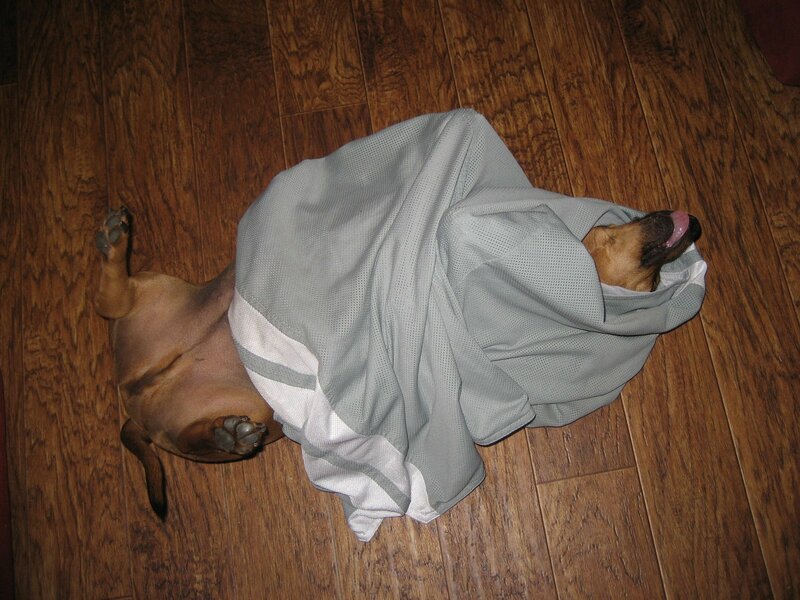 OK, now you all have been wondering what “Shorts” have to do with salmon and I don’t want you to have to wait anymore for this slice of cuteness…………. So…. 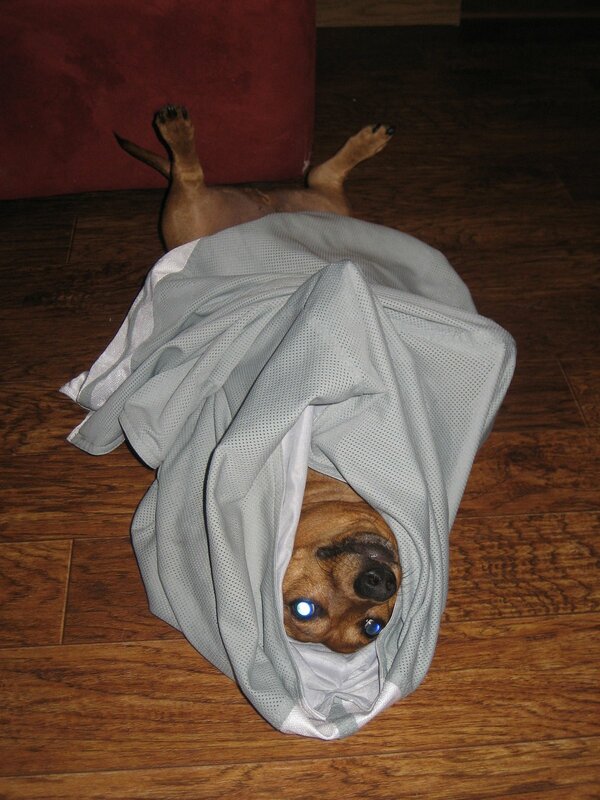 in the mornings when Matt gets dressed for work and he takes off this gym shorts (easy easy on the mental pic, HA) Oscar has always made a mad dash for the shorts and then runs with them, well one day he started crawling into them and then being real stiff as if he was waiting for us to take them away…. well it is so cute that now when pup crawls in the shorts we yell “Pup in Shorts, Pup in Shorts” and he gets so excited, his tail goes 90miles an hour, and he lays there waiting for us to come & tickle him!! And this morning I just so happened to snap some pics…. Please notice the wittle pink tongue hanging out….. Looks like a crime scene huh? Well Hello to you Oscar! 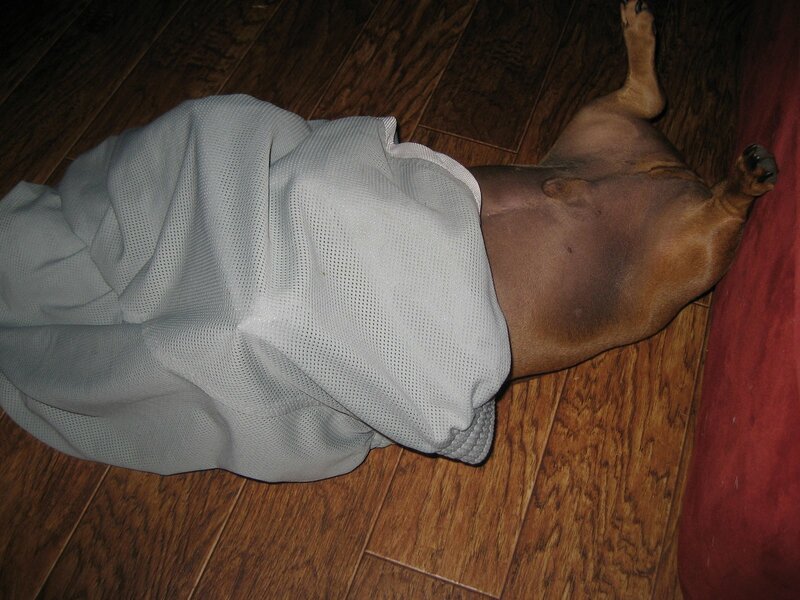 Anyways you may think it is stupid but it is one of “our things” and it brightens my morning when without me knowing I walk out of the bathroom and see “Pup in Shorts”!!!!!!! I think you should either come over and cook this for my fam…OR you could invite us over for one of your spectacular meals!! Did I actually just say that??!! Yep, I guess I did!! Ha! !